When someone says "Cross" or "Hook" to me, I immediately think of boxing and Ali's '65 KO of Liston with the "phantom right cross" or Sugar Ray Robinson's "Greatest Left Hook Knock-out" of Gene Fullmer in '57. 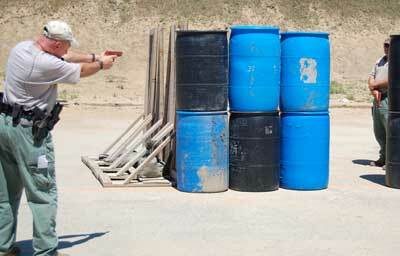 In the realm of firearm tactics, however, these terms take on a completely new meaning. 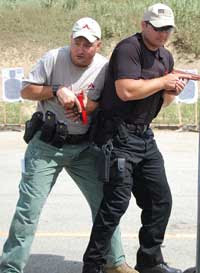 In fact, during the morning classroom portion President and head trainer John Krupa and instructor Dan Lombardo would spend significant time reviewing FBI data that 95% of criminals comply with police requests and that criminals in ensconced position are usually no different - they don't want flash-bangs, gas, or dogs in after them. This was contrasted with the remaining 5% who could probably be analyzed in terms of what the FBI calls "Killer Profiles", making them most likely to assault the entry personnel. Again, the facts point to the idea that unless there is a very compelling need to go in, you shouldn't - either they'll come out with some persuasion (and tear gas) or you're probably dealing with an extremely dangerous person. The course builds on a lot of the foundations established in Spartan's Advanced Pistol 1 and Advanced Pistol 2 courses. The morning saw a review of moving off the line of force and engaging, offensive movement ("HK Shuffle"), use of different sight pictures and a range session for "shaking out the cobwebs" when putting it all together. While there was a significant shooting portion, the course isn't really geared towards expending volumes of ammunition; their description calls for ~250 rds of ammunition and unless you're shooting a bit for fun at lunch, that's about right. The first real "room clearing" technique that we covered was the idea that rooms are divided into area that you can or can't see. The sections that you can see, you may be able to clear using either the "sneak-a-peak" or "slicing the pie" techniques. Again, the emphasis was on the idea that if you don't have to enter the room, don't! The concept of slicing the pie involves constant slow movement in an arc around the entrance in order to visually see and control all visible sections of the room. Krupa stated that it is important to start the scan low and then go high as shoes, feet, and kneeling assailants are all seen from below first. Also, it was stated emphatically that time is on your side and there isn't a thing as too slow when trying to "take ground" of an unknown area. "Slicing-the-pie" was contrasted with the "sneak-a-peek" technique, where one quickly exits cover, looks, then pulls back. The disadvantage being that once you pull back, you no longer control the area you just scanned. Once you've scanned the area available in the room, the only thing left are the corners closest where the assailant could be hiding. The rest of the techniques presented in the class focused on how to solve this tactical problem. A few "ground rules" were set out: It was explained that when you need to go in, it is better to use overwhelming force, shock and surprise to confuse the "enemy" and that movement should be executed as quickly as possible while retaining the ability to get combat hits at the maximum distance (~7-10 yards) in a room setting. From there two methods for getting to the corners as quickly as possible were detailed: the cross-over and the buttonhook. The crossover was demonstrated first and it involves a dance-like step for getting through the doorway as quickly as possible to check the corner opposite the starting location. If working with a partner, the number 2 man could do the same thing a split second later to cover the entryman's back if starting from the opposite side to the entryman. The buttonhook just involves heading for the corner closest to you when entering an unknown area. While these concepts seem simple, performing them without sweeping your partner with the muzzle and with the correct timing proved more difficult. Here's where Spartan's teaching methodology shines again: Krupa and Lombardo would break it down by demonstrating the techniques, pointing out the little things that made it smooth and then do it over. At that point they'd hand the blue guns to the students and observe the teams doing the exercises and offer pointers/corrections along the way. Once things were smooth, we jumped into putting the motions together with live fire. So, I'll never again blissfully hear the cross or the hook as just boxing terms, but rather will always think back to what I learned: "Don't go in unless you really need to!"